Your baby is ready to eat!! Your baby is ready to eat! Now what? We wait until around six months to introduce solids but most doctors say you can start anywhere from 4-6 months. It depends on neck strength to hold up the head, loss of the tongue thrust reflex that results in baby pushing out food, if your baby seems hungry even after breastmilk/formula, being able to sit up, and if your baby seems interested when you eat. Even when Charlie was doing many of these things I still waited until he was around six months. Always remember that in the beginning, feeding your baby is all for fun and it should be just that! You won’t decrease breastmilk or formula at first because you are feeding your baby small amounts just to get used to eating and to the many different tastes and textures. Make sure not to overfeed your baby in the beginning. Start out with two meals per day, feeding your baby 2-4 tablespoons. (4-6 months old). At 7-12 months, feed him/her three meals, each the size of a baby’s fist. You can pretty much start with anything, either fruits, veggies, or meat. As long as it’s pureed it doesn’t really matter what you choose. Baby led weaning is another option that I do not have experience with when it comes to first foods. Just a reminder that honey and corn syrup should not be introduced until after age 1. One thing I feel passionately about it giving your baby the highest quality of foods you can afford. Even if you don’t eat organic produce, grass-fed beef or free range eggs I personally feel the splurge is worth it for your baby. I skip right over rice cereal. There are so many reasons why but the main and most important one is that rice cereal contains arsenic. Yup, arsenic. I personally chose meat over rice cereal and grains which have the same level of fortification of iron and zinc as fortified cereals. To make up for that iron needed for breastfed babies only (there is usually enough iron in formula) I incorporate grass fed lamb and grass fed beef. Breastfed babies iron levels drop at around 6 months so they do need iron packed foods because their iron stores are depleted, your 6- to 12-month old baby needs to be consuming about 11 mg of iron per day. “Although babies do not need grains, they do need to eat complex carbohydrates, Peternell said, adding that butternut squash, zucchini and sweet potatoes are all excellent choices. If you choose to feed your baby grains, choose a variety such as oats, multigrain cereal, barley, quinoa and millet. In fact, breastfed infants who were fed pureed meat had higher levels of iron and zinc than those who were fed an iron-fortified infant cereal, according to a study in the Journal of Pediatric Gastroenterology and Nutrition. I like introducing foods that are nutrient dense. These include: blended red meat, egg yolk, liver, avocado, banana, squash, meat stock or bone broth. A 2016 study found that babies who eat along the lines of baby-led weaning are more likely to be deficient in iron, zinc, and vitamin B12, which are super critical nutrients for your growing baby. Vitamin B12 can only be found in animal foods, and the best sources of iron and zinc are found in red meat like grass-fed lamb or beef. Keep in mind that breastmilk is low in iron (whereas formula is iron-fortified), so we must get it through diet. Plant sources of iron are poorly absorbed—especially for an immature digestive system that has a harder time converting plant-based iron to the kind we can use—so heme (red meat) iron is best. To prepare: Once you cook the meat, be it ground meat, or a lamb chop or tender roast, put it into a blender with some filtered water or broth and blend it into a creamy puree to spoon feed to baby. Loaded with healthy fat, choline (great for baby’s brain and eyes! ), and necessary cholesterol—it’s the building block for ALL of our hormones—pastured egg yolks are an easy first food for your baby. Sensing how nutrient-dense egg yolks are, babies often gobble them right up (once they get used to the texture and taste, that is!). Egg yolks also contain important minerals that baby needs right now like calcium, zinc, selenium, phosphorus as well as vitamin E and vitamin B6. To prepare: Be sure to soft cook the yolks as not to damage the nutritional profile. Either soft boil the egg and take out the undercooked yolk, lightly poach the egg or cook it over easy. It’s best to serve egg yolks with a bit of fat for optimal absorption of the nutrients, as well as for better digestion (and taste!). Coconut oil may be easiest if it’s in liquid form. You can then sprinkle some shredded liver into it for an extra boost of nutrition. Offal, or organ meats, are not really part of our culture anymore—but they should be! Organ meats are still an amazing food choice due to their high concentration of nutrients. Liver is also high in true vitamin A, which is extremely important to baby’s development. (Yes, carrots and other orange foods contain beta-carotene, but it doesn’t easily convert to true vitamin A, which is why many babies turn slightly orange when they eat beta-carotene rich foods!) The best source of true vitamin A is animal products, particularly liver. Liver also contains vitamin D, all B vitamins, folate, zinc, and CoQ10. If you choose chicken liver, you get a good amount of iron as well, which is vital. To prepare: Purchase high-quality, grass-fed beef, bison or lamb liver. Cook over medium heat in a frying pan in a little ghee or coconut oil. Once one side is brown (not browned or burnt), flip liver and brown the other side. (It cooks fast so keep your eye on it!) You can then add to blender with a little water or broth and serve as a puree. Or, you can let the liver cool and then grate over baby’s egg yolk or banana mash. Do not over feed your baby liver, small amounts are the perfect size. Avocado is a great first food. It contains lots of healthy fats, as well as the almighty mineral magnesium, which is so crucial to our health yet is harder and harder to get enough of through our food these days. Avocado also contains B vitamins including niacin, vitamin E, vitamin K, potassium, folate, and fiber. To prepare: Cut a whole avocado in half lengthwise, and twist to open. Run a butter knife from top to bottom to make slices, and scoop out with a spoon. Likewise, you can mash or puree the avocado and spoon-feed it to your infant. It’s delicious mashed with ripe banana for a 1:1 ratio. Some people believe that baby’s first foods shouldn’t include any fruit because baby will get a preference for the sweetness. Truth is, baby already has a preference for sweetness thanks to breastmilk! So don’t worry about baby becoming a sugar bug because of fruit. Bananas are a great first carbohydrate source for babies because they contain amylase, an enzyme necessary for the digestion of carbohydrates (like, bananas!). Bananas are also a great source of important nutrients like vitamin B6, vitamin C, manganese, magnesium, and potassium. To prepare: Be sure to select bananas that are very ripe with brown spots as this is a sign that some of the banana’s starch has been converted to a simple sugar, making it easier for baby to digest. It will also be softer and easier to mash. Use a fork and mash by itself or with a little avocado, liver or egg yolk. Another easy to digest carbohydrate source is well cooked winter squash. It’s not as starchy as yams and isn’t high in nitrates (more on that below). Squash is also high in vitamin A, vitamin C, magnesium, potassium and manganese. To prepare: Cut open your acorn or butternut squash and remove seeds with a spoon. Put on a roasting pan with a little water and bake for 1 hour at 350 degrees, or until the squash is soft and the skin easily separates from the fleshy part of vegetable. Alternatively, you can put in your Instant Pot with 1 cup of broth or water and cook for 7 minutes. Let cool and scoop out flesh. Add in some butter or ghee, which will help convert the beta-carotene into usable vitamin A. Mash well with fork or immersion blender. Serve room temperature. Homemade broth or stock contains gelatin, an easy to digest protein, as well as minerals like calcium, magnesium, phosphorus, and sulphur.Broth or stock is particularly excellent at coating and soothing the digestive tract too, which can help strengthen it in preparation for eating harder-to-digest foods (like the difficult-to-digest proteins gluten and casein) later in life. To prepare: you can find a recipe (with a “how to” video) for chicken stock here. Once baby is a little older, you can add in some sour tasting foods like traditional sauerkraut. Cabbage is an excellent source of vitamin K, but in its raw or cooked state, it’s hard to digest. Fermented cabbage, i.e., sauerkraut, on the other hand, is amazing for digestion. The sour taste stimulates our digestive organs such as the gallbladder and liver. It’s naturally rich in health-promoting probiotics to help colonize baby’s gut with beneficial bacteria—crowding out the bad, and building up the good. Organic whole yogurt is another excellent food rich in easy to digest protein and fat and rich in calcium, vitamin D and phosphorus. It’s best to wait till 12 months before introducing dairy products (with the exception of eggs, butter or ghee). You can find great grass-fed yogurts at Whole Foods or prepare yourself at home. To prepare: Make your own sauerkraut, follow this recipe. If DIY isn’t your thing, you can also buy traditionally fermented sauerkraut in health food stores like Whole Foods. Make sure you find it in the refrigerated section and that there is no vinegar on the ingredient list. Vinegar is often added to mimic the taste of natural fermentation—even if the product is not actually fermented (thus not containing any beneficial bacteria). Offer baby a small amount of the sauerkraut juice to get him used to the sour taste. Soon, he’ll love it! “ Source: Mama natural. New research shows introducing common allergy causing foods by 12 months of age and as early as 4-6 months can be a good thing. Eggs, peanuts, and fish are some of these foods. Exposure may reduce the the chance of developing an allergy. You should give these foods regularly (2X per week to maintain tolerance. Start by rubbing a small amount on your babies inner lip and if tolerated after a few hours you can slowly introduce as part of their diet. ALWAYS have Benadryl on hand. 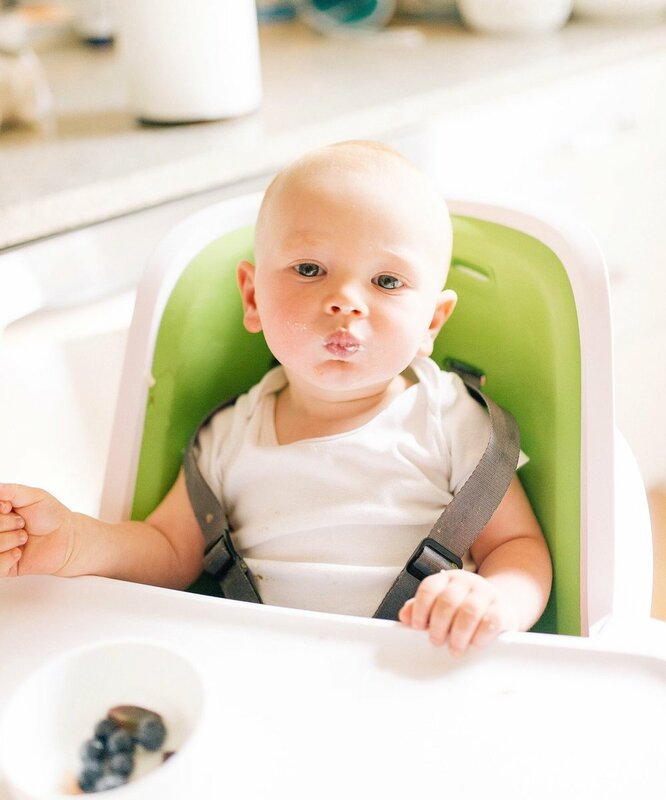 Baby products we love that have to do with feeding! Babybrezza has some great recipes, you can find them HERE. Scroll to the bottom of the link to find them. You can find a steam guide for steaming foods, HERE. You can find an ingredient guide, HERE. His diet hasn't really changed much since he has been 12 months old, so this could work for many ages. I'll give you a few different examples of what he eats at each meal. I always have his water out next to him during each meal. Strips of free range chicken dipped in egg and coated with Watusee Chickpea Crumbs. Grilled Cheese on Vermont Bread Company soft Whole Wheat bread- no high-fructose corn syrup - no artificial preservatives with white american cheese. Sides: Steamed or cooked broccoli, zucchini, Carrots. Charlie drinks a 5 oz. bottle of grass-fed milk when he wakes up, in the afternoon and before bedtime.